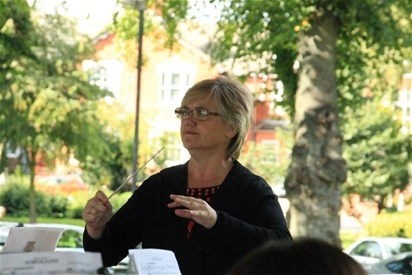 Rehearsals take place on Monday and Wednesday evenings from 8:00pm - 10.00pm led by our Musical Director - Cathy Fountain. We practise in the main concert hall of the Corby Silver Band club located on Denford Road NN17 2QW. Corby Silver, are an ambitious and lively 3rd section band who regularly participate in the Midlands area, Leicestershire BBA, Oxfordshire BBA and Midlands Beer & Brass on the grass contests. We work hard to ensure that our rehearsals are enjoyable as well as challenging the players, increasing player ability, building confidence and improving the overall standard of the band. We are lucky as we don't just have a band room, we have our own heated / air-conditioned band club, complete with a bar to purchase well earned refreshments for the break and after the rehearsal, when some of our members sit and socialise. As the band has expanded we no longer fit in the actual band room, which we now use for storage; so instead we use the main entertainment hall in the club. Our performance fees for engagements are used to provide the band with the funds to buy new instruments, music, uniform and to cover transport to contests, without there being any costs to band members.